​If you’re a beginner in screen printing, it’s only natural that you will make mistakes, and even if you’re a seasoned screen printer, there’ll be times when the image doesn’t come out quite as you wanted. Though screen printing ink is permanent, there are a few tricks you can apply to get the printing off your shirt. Now, in this post, we will explore the steps to remove screen printing from fabric and discuss several tips that can make the task effortless. As soon as you see those unwanted smears or that the image hasn’t come out as you wanted, rinse the garment in cold water promptly. By doing that, you’ll be able to take off any fresh ink. Keep in mind that the water has got to be cold and that if you use hot water, that will only set the fresh ink firmly into the fabric. Once you’ve rinsed it in cold water and the fresh ink has come off, rinse the shirt in some warm water. As the fresh ink will have come off, there’s no risk in rinsing it with some warm water. After removing all the ink that rinsing could remove, it’s time to allow the garment time to dry totally. At this juncture, some ink might still be holding on to the fabric. Once the shirt is dry, remove it and lay it on a flat surface before placing a paper bag on it, with the bag’s glossy side lying on the screen printing. Take an iron box that doesn’t steam and iron the bag where it contacts the screen printing. The heat from the iron will remove some of the ink and send it to the bag. Repeat this step until you can remove no more ink with this tactic. Put some sugar in your hand and use it to scrub the remaining ink gently. Using gentleness is very important as you don’t want to damage the fabric with rigorous scrubbing. By now, all the ink should be gone completely. If there’s still some ink left, try repeating the steps from the part about the paper bag. That aside, let’s look at several tips that can help you better remove screen printings from garments. 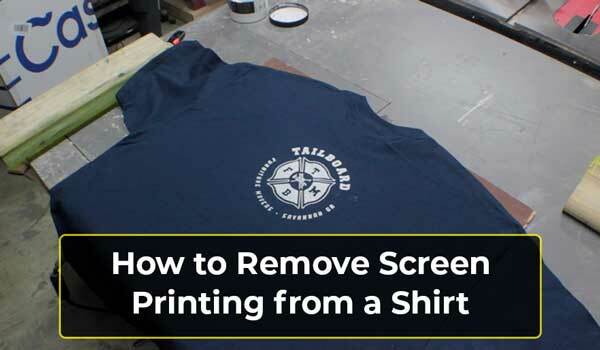 That’s how to remove screen printing from shirt, but in this section, we will highlight a few tips that can make the process even easier for you. Washing the shirt repeatedly fades the image. So, if the image hasn’t come off completely, consider washing the shirt more often, especially by hand, and focusing more on the part that has the faded image. Do not iron the shirt directly as this will only set the graphic firmly on the fabric. Acetone helps remove stubborn screen printings. The spotting fluid of high-pressure guns can also help you remove screen printings that don’t want to come off. When you heat-set the image on the garment by ironing, you make it permanent, and there’s little you can do to remove it completely. Washing frequently, will, however, fade the image. Spotting fluid is a dangerous chemical. It needs to be handled with care and kept out of reach of kids and pets. If the screen printing is hard to remove and you decide to use chemicals such as spotting fluid to remove it, make sure the area you’re working from is well-ventilated; you could even do it outdoors. Acetone is a bit safer, but you still need some ventilation. Put on some gloves when removing the ink with spotting fluid. That’s because your skin can absorb the chemicals in the fluid and get damaged by them. Don’t heat or iron the screen printing directly as that will only set the ink into the fabric and make it even harder to remove. If you have to use chemicals to remove the screen printing, consider the associated hazards and weigh them against the cost of a new shirt. If buying a new blank shirt is cheaper, better get one rather than working with hazardous chemicals like spotting fluid. How can I remove iron-on letter transfers? The first step is to heat the letters with a hairdryer. With the dryer set to the highest heat level, blow close to the letters, ensuring you’re giving attention to all the parts. After a little while, the adhesive should grow supple, rendering the letters easy to remove. In the event that you can’t get your hands on a hairdryer, steam the transfers off with a wet cloth and an iron box. How can I remove dried paint from fabric? Rubbing alcohol might do it. Just soak a cotton ball in the rubbing alcohol and use it to rub the stains repeatedly till the paint comes off. Nail polish remover can also help; use the same strategy of soaking a cotton ball and rubbing the stains. What do I do if the screen printing ink still doesn’t come off? Once you’ve tried all the methods of removing screen printing that we’ve described here but the ink still holds on to the fabric, consider taking the garment to professional dry cleaners. They might be able to do it for you. How do I remove silk screening ink from polyester? Use some warm water to dampen the printed area. Next, apply some dish soap to the graphic and use a soft-brittle brush to scrub the area gently. Is the image cracking or peeling off? Go on applying dish soap and scrubbing till all the silk screening ink has come off. You could use a little rubbing alcohol as a boost to make the removal more efficient. How Can I Use Nail Polish Remover to Remove Screen Printing? The first step is to soak the garment in cold water. Then, dry the garment in a dryer set to high heat. This will remove large areas of the printing or make them loose. Next, use your fingernails to peel the loose areas from the garment. Get a cotton ball and apply some nail polish remover to it before using the ball to rub the remaining printing. Nail polish remover contains acetone, which is the chemical that breaks up the ink in the screen printing. When rubbing, be sure to be gentle as you don’t want to damage the fabric. Put the fabric in cold water and wash it before drying it in a dryer set to high heat. The heat will loosen any remaining printing, and you’ll be able to peel it off with your fingernails. So, it turns out that removing screen printings from shirts isn’t that difficult after all. Just make sure you follow the steps as described, keeping in mind the tips and the warnings for efficiency and safety respectively. What other ways of removing screen printings are you aware of? Don’t hesitate to share your insights with us in the comments.